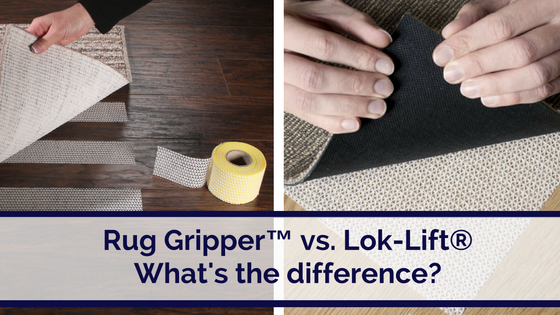 What is the Difference between Rug Gripper™ and Lok-Lift®? Many of our customers wonder what the difference is between Rug Gripper and Lok-Lift. While both products look similar to each other, Lok-Lift and Rug Gripper are designed for different types of applications. Rug Gripper is designed primarily for residential use as a slip resistant product that goes under rugs or mats to help keep them from moving and slipping. Lok-Lift, on the other hand, has a much stronger combination of adhesives that is specifically designed for commercial installations. Lok-Lift is used for both permanent and temporary commercial carpet installations. Want to know more? Visit our Rug Gripper and Lok-Lift pages or check out some of the below blog posts. How Long Does Rug Gripper Last Before It Needs to be Replaced?